All loaded up, bobbins wound, and ready to go first thing tomorrow. This past weekend, I had a wonderful retreat with some great ladies! Monday and Tuesday were spent preparing for the onslaught of Hurricane/Tropical Storm Isaac. The stores were packed with people. There was only one type of bread left and the battery section was pretty well stripped. 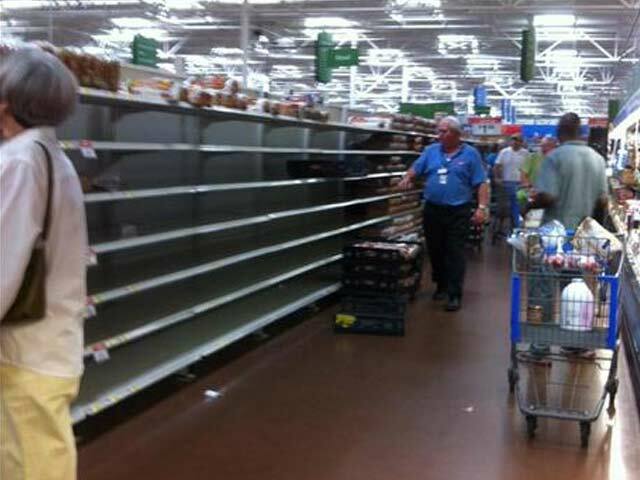 Every basket was loaded down and when you looked, there were lots of chips and drinks and you'd think that they were planning for a Hurricane Party instead of disaster preparedness. Now, we are "hunkered down" in our house hiding from Hurricane/Tropical Storm Isaac. We saw quite a bit of wind yesterday with the trees whipping around. So far today, lots of wind and not so much rain. The first rain we saw was this morning and it was more of a sprinkle or a heavy sprinkle. We are under Hurricane Warning, Tornado Warning and Flash Flood Warning. Scary. We lost power last night and got it back this morning so we were doing our best to keep up with things via the blackberry, emails and texts. This storm brings back memories of Tropical Storm Allison that came in and just sat on us, just like this. Spending quite a bit of time watching the Weather Channel. Really feel for those people down in Plaquemines Parish. Trying to remain calm and think positive. It's gonna be a long ordeal. 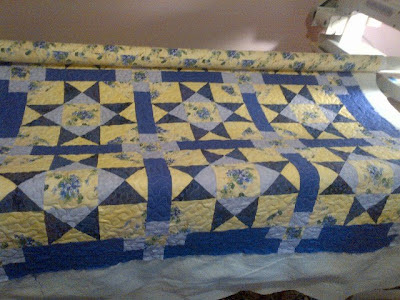 108 Quilts & Do you keep track? Do you keep track of your UFOs (unfinished objects) or WIPs (works in progress)? For the longest time, I didn't really track anything. Quilts in various stages of completion were just in different places around my sewing room and I had no idea how many there were. Then our quilt guild started a UFO Challenge. At the beginning of the year, each participant would make a list of UFOs and what stage of completion they'd like to reach by the end of the year. After that I started trying to keep track of things more. I tried doing it on my calendar. I tried creating a To Do List. Each process had its pros and cons, but none of them was really perfect. In the end, I went "old school". I have a bulletin board on the wall in my sewing room. I have labeled areas for different stages of the quilt. 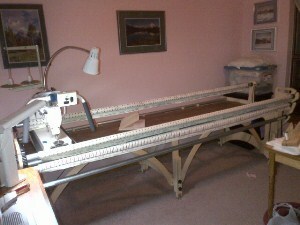 Each quilt is on a small piece of paper and I can move it from one area to another as I go from one stage to another. Like I said, it's "old school", but it works for me. It's all in one place where I can see it at a glance. 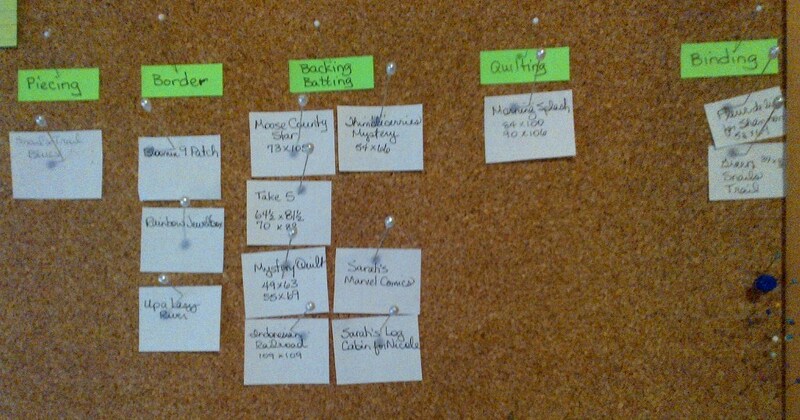 It makes it easy to see what needs doing at any particular time so it helps keep me on track. So, do you keep track? What is your process? I also have a spreadsheet of all the quilts I have made. 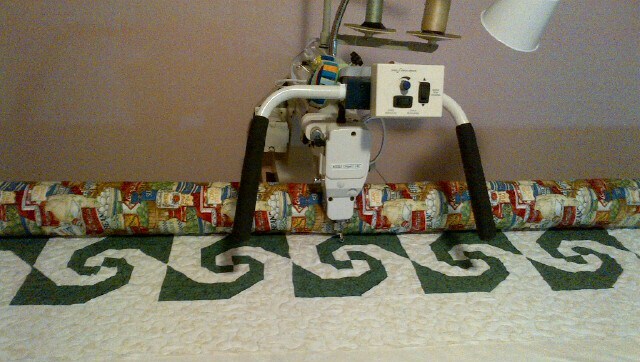 The most recent one I finished, a green snail's trail, was the 108th quilt that I have quilted. That includes 48 of my own and 60 that I have done for others. What a shock! If I didn't have a spreadsheet, I would never have believed it! Service Project well on it's way! I made my way through this crazy snail's trail this evening. It was something I got from my friend Norma's stash. It's destined for the Krewe of Quilters Service Project. The back is rather wild, but it should serve to liven up the quilt, since the front is so subdued. At this rate, I should have plenty of binding to do at next weekend's retreat. One down and many many more to go. Lizzie and I have just completed our first quilt together and it took no time at all. I just know that this is the beginning of a wonderful friendship. We are going to be BEST Quilting Buddies. I've spent the last 2 years without a stitch regulator and to have one now is so wonderful. I can certainly appreciate it after having none. It is so much less stressful to be able to sew. Lizzie is willing to go whatever speed I want to at whatever time and I can changed whenever I want to. It's amazing! Finally finished up all the reorganizing and got everything in a position where I can actually use it. 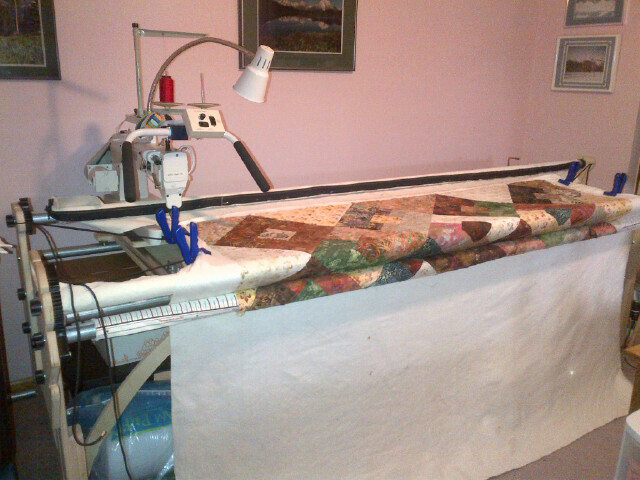 Here is a picture of the first quilt loaded on the frame and ready to start quilting. This quilt is for DBF's sister-in-law. Her birthday was on Christmas Day, but I was just too buried to have hers done in time, so I did the next best thing. I gave her a birthday card with an IOU ONE BIRTHDAY QUILT in it. It's taken me forever, but I'm finally getting there. I've already made quilts for him, his parents, nephew, brother-in-law, niece, sister-in-law, niece, brother-in-law and now this final sister-in-law. Whew boy! And it only took me 2 years to do them. Helping my friend Sarah get her house in order, helped me decide to get my own house in order. Well, that and buying the new machine, which necessitated reorganizing. 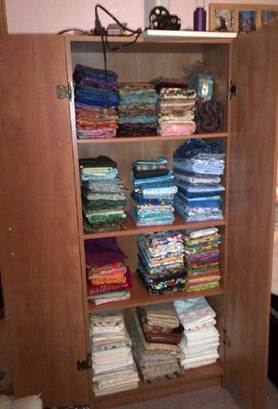 I only THOUGHT I didn’t need any more fabric, but now that I can really SEE how much fabric I have, I KNOW that I don’t need to buy any. But, as you know, that doesn’t keep me from WANTING to buy more. 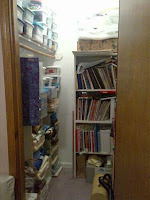 The left side of the closet. You can see the floor! 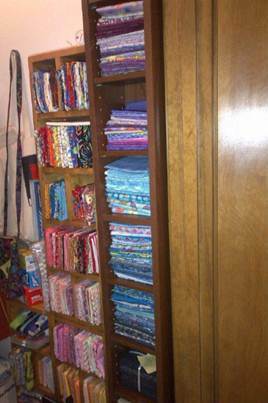 The right side of the closet where all my fat quarters are. I've been stressing and stressing over what to do about converting my time to qualify for retirement. I was concerned about whether this was in my best interests. I tried making a list of pros and cons. Of course the "pros" list was really easy, because that's what I want. The "cons" list was a lot harder, because I didn't really want to acknowledge them at all. I've been to Human Resources to ask questions. I've spoken to LASERS to get some answers. I've stressed and stressed! Today, I finally discussed it with DBF. Why, you ask, did I not do this before now? Well, to be honest, I had to decide what I really wanted and what I really thought, before getting into that conversation. I thought it would be a difficult one, but it was not. When I brought it up, he immediately told me to "do it. It's a no-brainer." If I go ahead and convert my air time to real years of service, then I'll be eligible to retire and walk away in January of 2013. But I'll also have the option to just enter DROP in January of 2013, which would allow me to make my money back and then some if I work 9 more months while still maintaining the ability to walk away whenever I want to. And even better, when the legislature brings up the retirement bills again, I would be beyond it. I have been on the smallest blood pressure pills now for the past 2 years or so. I know that part of the reason for that is stress from work. Crazy thing happened to me yesterday. I went to the blood drive yesterday and when they took my blood pressure, it was 120/50. Yes, you heard right. 50! I said to the poor girl "oh no honey, you need to do it again." She took it again and guess what? It was 120/50. Amazing what it can do for your stress level (and your blood pressure) when you start to realize that you might be able to retire soon. That's another PRO to the list, don't you think? It was a long day of disassembling the frame at her house and then taking practically everything out of my sewing room and then disassembling my old frame and then re-assembling the new frame. Sounds all cut and dried, but you would have died to see how much came out of the sewing room . The bedroom was totally full of stuff in order to make room. This picture shows the room after the assembly and before moving all the stuff back in. I was totally exhausted, but I am so happy to have Lizzie in my house. We’re gonna be best buddies! My first goal is to just meander a quilt and make sure things are working well. Then, I want to try something new, a new challenge. I have wanted to branch out for a while now, but have never been comfortable even attempting it. Now that I have the stitch regulator, I’d like for that to change.